This book is intended to provide prospective real estate licensees with a thorough review of the knowledge necessary to pass the national PSI real estate exam. The text is presented precisely according to PSI’s published “expanded” outline of over 170 real estate topics that may appear on the PSI exam. The author, Jim Bainbridge, is a Harvard Law School graduate, a practicing attorney, and a licensed real estate broker. He has carefully written this book to help you prepare for — and pass — the PSI real estate exam. 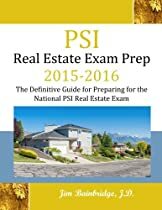 The book contains:•a comprehensive review of the real estate principles covered by the national PSI real estate exam; •a complete 80-multiple-choice-question practice exam, with detailed answers given for all of the questions, which will allow you to assess your strengths and weaknesses — and to hone your test-taking skills — before exam day;•a thorough review of the real estate math that you are expected to know for the PSI exam;•tips on preparing for and taking the PSI exam; and • a useful glossary of more than 600 key real estate terms for test preparation and reference.